You may not know this, but Story Planet is orbited by no fewer than 17 moons, so Lunar New Year is a very special time in our corner of the galaxy. Traditionally, our Lunar New Year festival is a weeklong celebration of creativity, spontaneity, reflection, and competitive moon-walking. 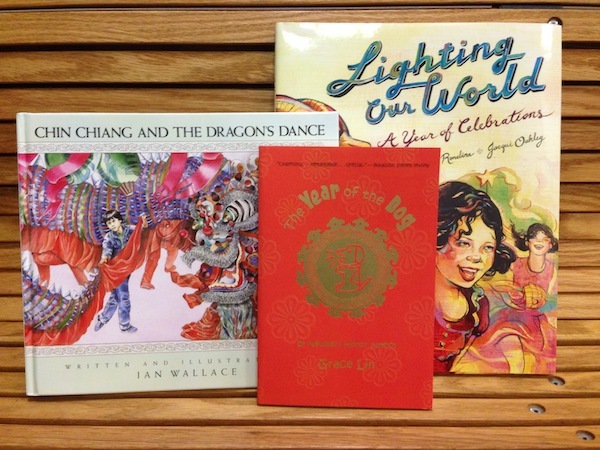 For those of you celebrating Lunar New Year on Earth, we have some book recommendations to share. These titles (and more!) are all available at Story Planet’s Intergalactic Travel Authority, or at your local library. Even though we’re in the year the of the horse, Grace Lin’s chapter book, “The Year of the Dog,” is a heartwarming tale for all seasons. The story follows Pacy, a Taiwanese American girl who is finding it difficult to be both Taiwanese and American at the same time. Pacy learns that the year of the dog is the year she is destined to “find herself.” Although there are some bumps along the way, the new year brings Pacy a fresh perspective on how to be many things at once, and she discovers the importance of friendship, family, and finding one’s passion. In this beautifully illustrated tale, we are celebrating the year of the dragon. Chin Chiang, a Chinese Canadian boy, is nervous about performing the dragon dance at the New Year festival for the first time. Worried that he will let his family down, Chin Chiang runs away. But he can’t escape his responsibility forever. With the help of an unexpected friend, Chin Chiang regains his confidence, and faces his fears. This colourful information book explores of celebrations of light across the globe. Catherine Rondina shares exciting stories of new and old customs told from the perspectives of children from 31 countries around the world. The rich and energetic illustrations by Jacqui Oakley lift these stories right off the page. How do you celebrate Lunar New Year? Tell us in the comment section below! National Family Literacy Day is an annual awareness day started by ABC Life Literacy in 1999 to promote the importance of fostering literacy in our communities and at home. This year Family Literacy Day falls on a Monday – January 27th to be precise – but why limit your celebrations to one day when you could be riding the reading and writing train all week? We have plenty of suggestions for how you and your family can share a story together throughout the week. We’ll start with the obvious: Read a book together! Our Social Enterprise Manager Extraordinaire, Beck, has been recommending the classic Norton Juster children’s novel, The Phantom Tollbooth, left right and centre recently. Story Planet’s Alien Chieftess, Liz, recommends The Unlikely Hero of Room 13B, by Teresa Toten for middle grade readers. The bilingual (English and Cree) picture book, Caribou Song by Tomson Highway and John Rombough, is the current favourite of the Head of Interstellar Communications, Genie. These titles and more are all available to purchase at the Intergalactic Travel Authority. If the storytellers in your family are not at the reading and writing stage yet, or happen to thrive on oral storytelling, why not explore literacy through digital media tools. Hilary Leung, author of the Ninja Cowboy Bear series, and The Pirate Girl’s Treasure, recently introduced us to Sago Sago, a company that creates storytelling apps for kids. 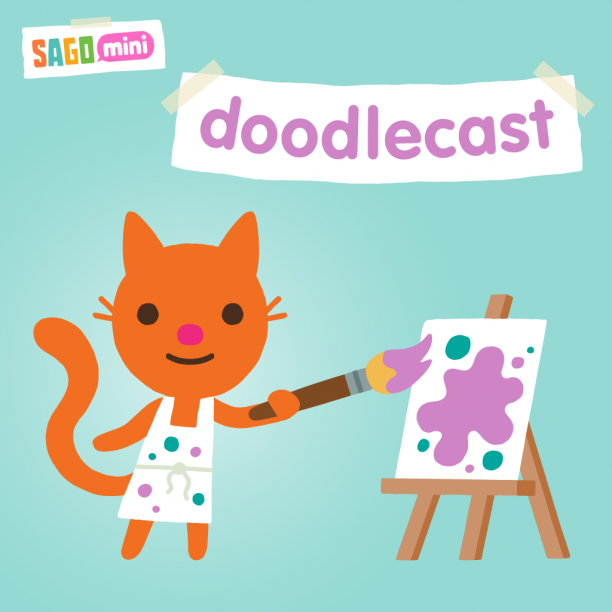 An app like Sago Mini Doodlecast allows you to draw and record your voice at the same time so that you can tell a story as you illustrate, or just capture your whole creative process at once. More advanced readers and writers should explore Wattpad – an online platform for storytellers. On Wattpad you will find stories written by both Margaret Atwood and your neighbour down the street. Explore new genres, discover new authors, or publish your own work! Have fun with your words by playing a literary board game. Tried and true classics like Scrabble and Boggle are always fun, but there are so many more games out there to discover. Bananagrams is a raucous no-holds-barred, free-for-all version of Scrabble, where players compose their own word chains and race to be the first to use up all their tiles. Rory’s Story Cubes are an excellent prompt for story writing: simply throw the dice and compose a story based on the pictures that come up. Bananagrams, Rory’s Story Cubes, and many more fun literary games are available to purchase at the Intergalatic Travel Authority. Spend your P.A. day at the library with everyone’s favourite coward, Scaredy Squirrel! Scaredy and the librarians at the Amesbury Park branch of the Toronto Public Library have organized a literary scavenger hunt for adventurous readers (but not too adventurous!). Visit the TPL website to see the many other Family Literacy activities happening all this week and next. Participate in a Story Mob! “A what?” you ask, allow me to explain. Much like its predecessor, the Flash Mob, a Story Mob is a secret gathering of people that appear all together all at once to add some magic and whimsy to the lives of passers-by. But instead of hitting each other with pillows, or doing Michael Jackson’s “Thriller” dance, Story Mobs recreate a beloved children’s story. Small Print Toronto has teamed up with the the TPL to organized several Story Mobs at locations throughout the city. This Saturday they are taking on Julia Donaldson’s Gruffalo, which is celebrating its 15th anniversary this year. For reader parts, costume ideas, and more info on how to get involved, head on over to the Story Mob website. 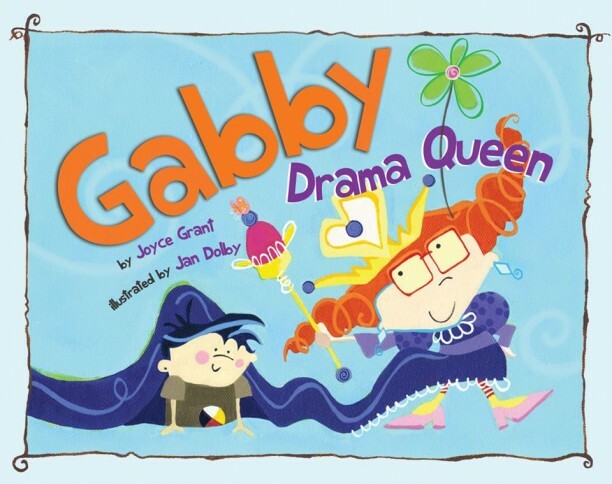 Bring your family to Story Planet for the launch of Gabby: Drama Queen, a new book in the Gabby series from author Joyce Grant and illustrator Jan Dolby. There will be fun activities and games all afternoon, and both the author and illustrator will be there to sign copies! You might also want to pay a visit to the Ontario Science Centre for their star-studded Family Literacy Day line-up. Robert Munsch, Ruth Ohi, Kenneth Oppel, Kevin Sylvester, and other bright literary lights will be in attendance! The theme for this year’s Family Literacy Day is “15 Minutes of Fun.” ABC Life Literacy has an excellent list of ideas for how you and your family can share some time together and improve literacy at the same time. Best of all, these activities are simple and free! Why not invent your own riddles together (#6), or make up a recipe together and post it online (#3). Head over to their website for the complete list. On the surface, January will look like a quiet month at Story Planet. But don’t be fooled by our cool collected demeanour because, just like ducks, we are paddling furiously just below the surface trying to organize all the incredible programs and events we have planned for 2014! In the meantime, we have some fabulous friends who will be using our space to run their programs starting this weekend. See below for more details! Classes run Saturdays, Jan 18 to March 22, 2014 (9 classes in total). No class February 15, March 8 due to holidays. We are offering three classes for ages 10 to 18: Youth Foundations 2 from 12-2 pm, Youth Foundations 1 from 2-4 pm and Youth Performance Ensemble 4-6 pm. You can find more information on each class on the Youth Academy site. Each class will participate in our Academy Showcase on March 23 at Palmerston Library. We will also be presenting the premiere of our Bad Dog Kids Show on Saturday, February 1st at Palmerston Library. This is monthly improv show for kids and families that provides an exciting alternative to Saturday morning cartoons and brings childhood literacy favourites to life with an improvised twist! Are you interested in sharing mindfulness with your children? In this 4-week program, Sara will introduce child-friendly mindfulness practices to children and their families that they can then practice together at home. Practices will include games, songs, stories, art activities and everyday mindful awareness practices that can help to reduce stress and support connection in today’s often hectic households. WHO: For children ages 6-8 and their caregivers. WHEN: January 20 – February 10, 2014 (4 Mondays), 6:30 – 7:30 p.m.
WHERE: Story Planet. 1165 Bloor St. W. (Bloor just West of Dufferin). Please email info@mindfulfamilies.ca to register. Space is limited to 5 families. Sara Marlowe is a Registered Social Worker (RSW) and so the program may be covered by some extended benefits plans. Please discuss with your insurance provider. You may know Zoe Di Novi as Volunteer Coordinator extraordinaire, but did you also know that she was a volunteer Volunteer Coordinator? Or is that Volunteer Coordinator volunteer? 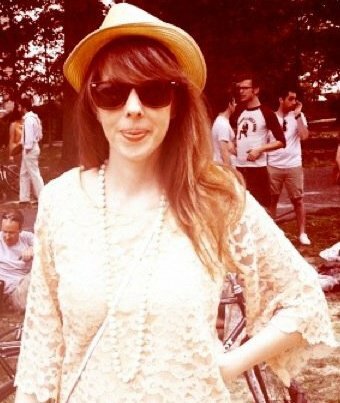 Anyhoo, although she was with Story Planet just briefly, her creativity, exuberance, and wise-cracking ways made her a natural fit for the Story Planet team, and she will be sorely missed now that she’s found a more lucrative outlet for her talents (congrats on the new job, Zoe!). We wish her all the best, and demand that she come visit us soon. 1. Favourite Planet to live: Story Planet, obvi, but if that one’s all full, then I guess I’d live happily ever after on the planet of Warm Cider On A Cold Night, with a stop off on Venus. 2. Favourite book or the last great one you read: I’m in the midst of Margaret Atwood’s Cat’s Eye and digging it hard, but this summer I devoured Alice Munro’s collection The Love Of A Good Woman and Hilary Mantel’s Wolf Hall. 3. Favourite writers: Edward St Aubyn, Anais Nin, Anthony Doerr. 4. Favourite thing to do on Earth: Watch and talk about movies. 5. Favourite Earth food: Bread pudding. 6. Favourite moment/memory from your experience here: My first day volunteering with the kids in Story Club just happened to land on Halloween. Princesses, masked superheroes, deer, cavewomen, Charlie Chaplin – the Story Planet atmosphere came alive with its own eccentric cast of characters. The day is a wild blur of genre, enthusiasm and laughs and I couldn’t have been happier to have been a part of it.